Sandy shores and dunes in the northern part of Lake Michigan. 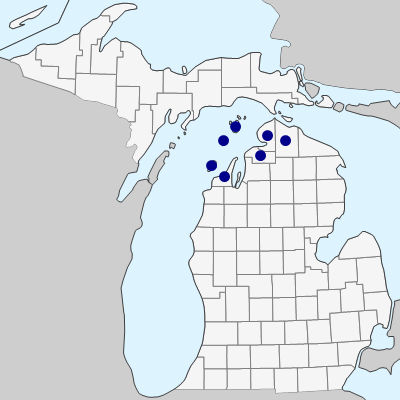 The main range of this species is in Alaska and northwestern Canada, southward into the Rocky Mountains and Black Hills; stations in Michigan and Ontario are strikingly disjunct. MICHIGAN FLORA ONLINE. A. A. Reznicek, E. G. Voss, & B. S. Walters. February 2011. University of Michigan. Web. April 21, 2019. https://michiganflora.net/species.aspx?id=2038.